Enchantment Box is a 100% vegan and cruelty-free subscription box that bills themselves as “ the subscription box for women that believe in magic.” Expect goodies you can use to pamper yourself like makeup, bubble bath, paper goods, crystals, candles, sweet treats, and jewelry. COUPON: Use code Enchanted15 to save 15% off your first box! Good to Know: They normally ship around the 20th of each month, however, the June box will be shipping early so the owner of the box can enjoy a much-needed vacation! Here is the info sheet on the items in the box, along with coupons for the brands included. 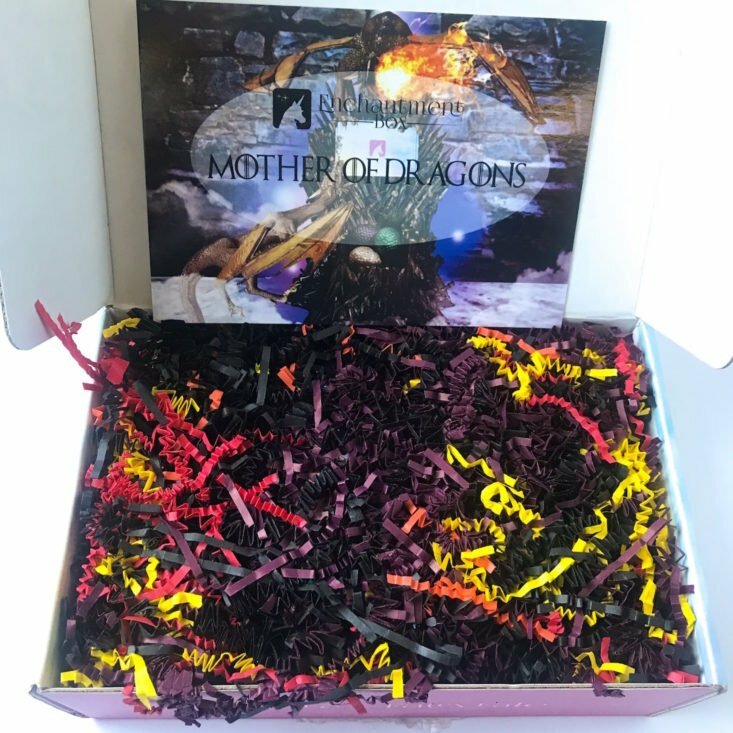 I absolutely love Game of Thrones, so I am hyped to see what products came in this Daenerys inspired box. This candle is stunning! It is an Enchantment Box exclusive and the scent is a blend of saffron, sandalwood, and dragon fire. I love the scent, but I am bummed that when lit the scent throw doesn’t travel very far when lit. To enjoy the scent I pretty much have to have the candle right next to me, which isn’t the most convenient. Oh well, at least the glitter is beautiful. The detail in this soap is just absolutely stunning. It has a scent blend of crackling warm woods blended with a hint of sweet raspberry and vanilla. It smells great, but the real issue is that this soap is almost too pretty to use. If y’all have read any of my reviews you know I love a good bath bomb, so finding this dragon’s egg bath bomb inside the box was a real treat. This one was inspired by Drogon, but if Viserion or Rhaegal are more your style those are available too! This bomb is scented with dragon’s blood, which reminded me of a soft amber musk. Kurtis Rykovich is an artist with a very unique style. 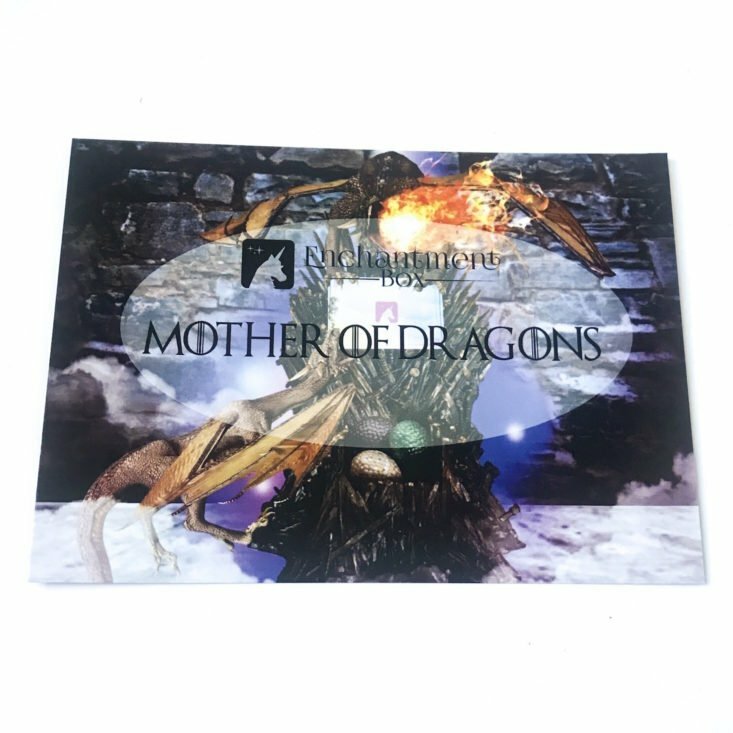 His main products are prints, so getting this ring is a unique way to celebrate the artist’s take on Daenerys. The ring is adjustable and features Daenerys with her three dragons around her. Here we have a truly tiny Daenerys keychain featuring her in her snazzy white coat from season 7. She measures in at about an inch and a half tall, and this is an adorable way to keep the Mother of Dragons with you at all time in case you need to draw on her strength and be a strong, powerful, unapologetic woman. This is another Enchantment Box exclusive item, and it smells great. I love a good body oil (they’re probably my favorite way to moisturize) and this is a luscious blend of argan, coconut, davana, lavender, patchouli, and sandalwood oils. I can totally picture Daenerys using this to moisturize her skin or add shine to her intricate hairstyles! Nail wraps are such an easy and quick way to get some fancy nail art in your life. I love the gorgeous blue hues of these scaly designs, and there are enough sizes that you should be able to find a perfect fit for every nail. This tea is another box exclusive and it is a blend of Chinese and Ceylon black tea with blue cornflowers. The tea leaves are beautiful, and the flavor was a unique blend of smoked peach with a hint of peppermint. This is the kind of tea I would reach for in the morning to pep me up. The Verdict: I haven’t had a bad box from the Enchantment Box yet, and this Game of Thrones box is one of my favorites! I love both the obvious and subtle nods to the Mother of Dragons, and all of the products were fun. I think the bath bomb was my favorite, but there isn’t a bad item in the batch. As usual, the box curation was great and I look forward to next month. Overall, I calculated a value of $79.85. Can you get this box if you still sign up today? No, you will start with the December box. 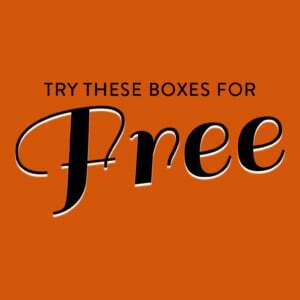 Coupon – Use code Enchanted15 to save 15% off your first box! Value Breakdown: This box costs $49.95 + $7.95 shipping, which means that each of the 8 items in the box has an average cost of $7.23. 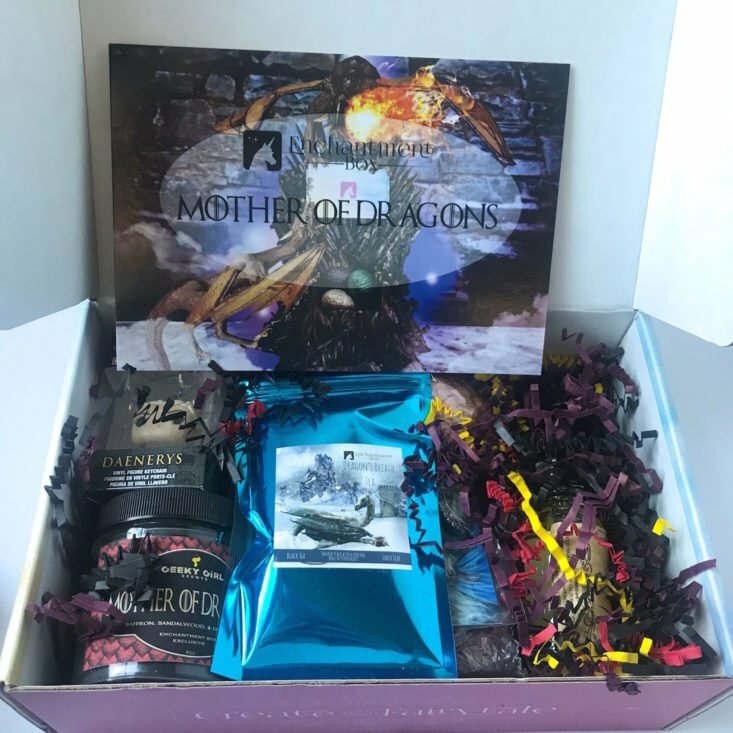 Check out all of our Enchantment Box reviews to learn more about this subscription! What do you think of Enchantment Box? Are you going to subscribe? How do subscribers rate Enchantment Box? Do you subscribe to Enchantment Box? Add your rating now! How exactly do you use body oil? Do you rub it on/in like lotion? Does it leave your hands greasy? That is exactly how I use it! Only a few drops at a time, and at the end I use whatever residue is on my hands to rub into my neck or stomach or somewhere and then wipe off my hands on a towel. I subscribed for three months I think it was, while I thought the boxes were cute and different, I found it to expensive for what you get. I would have really enjoyed this particular box, but not at this price point. If they ever lower, I’ll go back in a hot second. A candle with no throw is worthless imo. I’m curious about what you, as a law student, think about these products using copyrighted phrases as well as the actress’s likeness. Is this legal? I love GoT, but I’d feel funny about buying a box without knowing that it’s on the up and up. I did take an intellectual property course, and all I can really say is it isn’t so cut and dry. I would need more information on how the individual creators marketed their products to give a more informed opinion. Sorry, I know this doesn’t help. I do know Funko is officially licensed, and I believe there is enough artistic creativity in the other items to not be infringing. I would say this box is on the up and up, but my opinion in that regard doesn’t really hold weight until I pass the bar. It’s a “nice” box but much too expensive. Too many bath and body items lately (this and December’s spoilers). Hi, I think Mother of Dragons theme was November…. Nutcracker is December per the spoilers. You’re right, this is the November box. Sorry about that!